Available in your choice of Cherry (pictured Front) with a cinnamon stain, Mahogany (pictured left) with an auburn stain or Walnut (pictured rear) with a dark mocha stain, each with a satin finish. 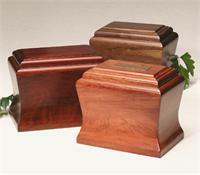 You may choose to further personalize this urn with any of our optional engraved plates. Please see bottom of page for more details.